Birdoswald Roman Fort stands on the line of Hadrian's Wall a little over a mile west of Gilsland and some six miles north east of Brampton. Access is from the unclassified minor road which follows (and in places is built on) the line of the wall here. The visitors' car park is a little over a quarter of a mile from the site (disabled parking is available on site) and from here you walk uphill to the fort, enjoying as you do so the sight of the considerable length of relatively well preserved wall which extends to its east. 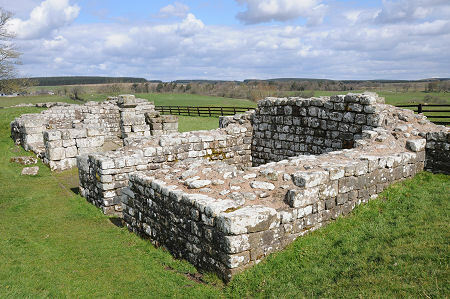 What you find at Birdoswald are the remains of one of the Roman forts built along the length of Hadrian's Wall. The outer defences of the fort are among the best preserved and most readily viewed of any of the wall forts. You can also explore an area of the fort exposed through archaeological excavation, and view a collection of finds and other information in a well presented exhibition area. What is unique about Birdoswald is the evidence that has been unearthed, and which you can see, of occupation that extended well beyond the Roman period into what we choose to call the Dark Ages. Add in traces of a tower house built on the site around 1400 and the foundations of a bastle house built in about 1650, and the result, far more than anywhere else on Hadrian's Wall, is a sense of long term occupation rather than the more usual snapshot of the Roman era. Though having said that, it is easy to forget that the Romans were here for a very long time indeed. Their first fort on this site was built in about AD125, and Birdoswald remained an outpost of the Roman Empire until central authority finally crumbled in AD410. To put that another way, if you assume that the decline and fall of the Roman Empire in Britain is taking place right now, then the first fort was built at Birdoswald some 270 years ago, which takes us back, approximately, to the time of the 1745 Jacobite uprising. That is a long time, even seen through modern eyes which benefit from a well recorded history and relatively long life expectancy. For most of the Romans and Romanised locals, living here in the 300s, the origins of the Roman presence must have seemed lost in the depths of a time so long it was almost immemorial. This was, presumably, a world in which many things seemed constant and unchanging to the people living within it. This suggests a striking contrast to our own world, in which the only constant is rapid change. Despite this, the Roman occupation of Birdoswald was over a sufficiently long period of time to have allowed many changes to take place in the design of the fort, in the construction of the wall on either side, and in the internal arrangements and layout. Add in the many subsequent developments that took place here and the result is an exceptionally interesting site, though also an exceptionally complex one. Birdoswald is a site where reading the guide book at the start of your visit really helps: otherwise the significance of some of the methods used to distinguish between one phase of development and another might easily pass you by. Your visit to Birdoswald begins in the reception and shop, and then moves to the exhibition on the upper floor of a neighbouring building. Here you can view some of the finds that have been unearthed at Birdoswald over the years, and meet life size residents as well as Reginald Bainbrigg, who in 1599 was the first antiquarian to visit the site; and a more modern archeologist. From the exhibition you pass outside the west wall of the fort before curving round to enter it through the main western gate, one of four double gateways that provided access to the fort, along with two single gateways. Even here the archaeology is complex, showing signs of the original turf wall laid here before the fort was built, and of the way one of the pair of gateways here (and in the eastern gate) were blocked up in the late 200s. Beyond the gate the core area of the site is delineated by the farmhouse building on the northern side (now used as a hostel) and a wooden fence enclosing the excavations. The main Roman remains on view within the outer defences of the fort are the two granaries, extending away from you and slightly to your right, and part of a drill hall, which originally extended underneath and beyond the farmhouse. In some ways, however the most striking features are the wooden posts set within the excavated area: a rectangle of large diameter posts facing the farmhouse, and two rectangles of smaller diameter posts on the western side of the interior. The features identified by these posts seem to offer the best evidence of continuing use of Birdoswald into the Dark Ages. 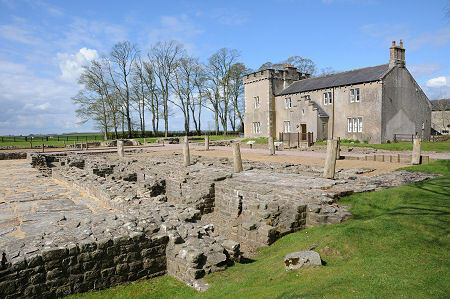 What has been found suggests that the Roman garrison and civilian residents of Birdoswald, or Banna as they would have known it, continued to live here after the end of central Roman authority, perhaps providing an income through provision of military protection to the wider area in very uncertain times. It is possible that they then evolved into a sort of autonomous militaristic tribe, perhaps under the command of a hereditary leadership that evolved from the Roman military command. The first significant change in use that has been found came in the mid 300s, relatively late in the Roman period of occupation, when the more southerly of the two granaries was adapted for what appears to be use as a hall. Rather later, and certainly after AD 395, a timber building was erected on the site of the north granary, which by now had long since collapsed. Meanwhile two smaller timber buildings were built on the west side of the site, in what had previously been the open area behind the wall of the fort. Some time later still, presumably well into the 400s if not later, a much larger timber building was erected, replacing the earlier structure on the site of the north granary and extending well beyond it, to cover much of what had once been the main street of the fort. It is difficult not to interpret this as the great hall of a Dark Age chieftain whose ancestor had once been the Roman officer leading the troops here. Occupation of Birdoswald seems to have ended at some point during the Dark Ages, only to resume again in about 1400, when a defensive tower house was built here. Traces of its foundations can be seen in the excavated area in front of the farmhouse. Not far away are the traces left by the tower house's successor, a bastle house built in about 1650. Also of note at Birdoswald is the exceptional preservation of much of the fort wall and the gateways leading into it. The line of the north wall is lost under the later road, but otherwise the walls are remarkably complete up to a significant height. Following the walk laid out along the outside of the west wall and around the southern side of the fort is highly recommended, not least for the surprising and highly impressive view of the valley of the River Irthing that suddenly opens up. The fort's main eastern gateway is the best preserved on Hadrian's Wall, and offers a number of intriguing insights. What is very noticeable is the way one side of the gateway was blocked off in the late 200s. Also very striking are the remains of the sockets in which the metal-shod wooden posts on which the gates hinged would have fitted.